Dr. Padmashri V is an Obstetrician in Apollo cradle Jayanagar 5th Block, Bangalore and has an experience of 22 years in this field. 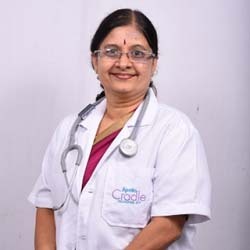 She completed MBBS from Guntur Medical College, Guntur in 1995, MD – Obstetrics & Gynaecology from Guntur Medical College, Guntur in 1996 and DNB from National Board Of Examination in 1996. She is a member of Bangalore Society of Obstetrics & Gynaecology. Service provided by the doctor is: Normal Vaginal Delivery (NVD). Dr. Padmasri has all the qualities one looks for in a perfect doctor. She made my labor a smooth one. The nurses were so generous and caring. We are always grateful to the entire Apollo Cradle team. Dr. Padmasri at Apollo Cradle has made my birth experience an awesome one. Including the nurses and housekeeping staff each and every team member had made my hospital stay very memorable. I will always be thankful to Apollo Cradle for making my labor and delivery and uncomplicated one. I will highly recommend this as the super place to opt for! I was under the care of Dr Padmasri in the NICU of Apollo Cradle, Jayanagar. She is trustworthy and reliable. She is experienced and guided me throughout the way. I had confidence in her all through. The team of nurses here is dedicated and hardworking; the support staff is helpful as well. All in all, I had a good experience here. I am grateful to Apollo Cradle for their service. Thank you. Mrs.Pavithra Arvind Sharma – Jayanagar,Bangalore. I was admitted to the Apollo Cradle for my delivery and my experience was nothing short of great. The entire team at Apollo Cradle is dedicated and hardworking. I was under the care of Dr Padmasri. She is professional and understanding. Throughout my stay, I was guided and the nurses made sure I was comfortable and all my needs were met. The meals are hygienic and healthy. The hospital is kept clean as well. Great service by Apollo Cradle. Thanks to the Apollo Cradle team for delivering my baby and giving us this precious gift. Special thanks to Dr Padmashri for taking such good care of me. The entire support staff is talented and helpful. The services including the food and the rooms are very good. I would surely recommend Apollo Cradle to others. Very courteous staff and good service at Apollo Cradle Jayanagar Special thanks you.